Ky. Lawmakers Didn't Consult Federal Experts About Limiting Black Lung Claims Reviews : The Two-Way The federal agency that certifies physicians who diagnose black lung confirms it was not consulted, while medical groups call for repeal of the state law that they say will hurt sick coal miners. 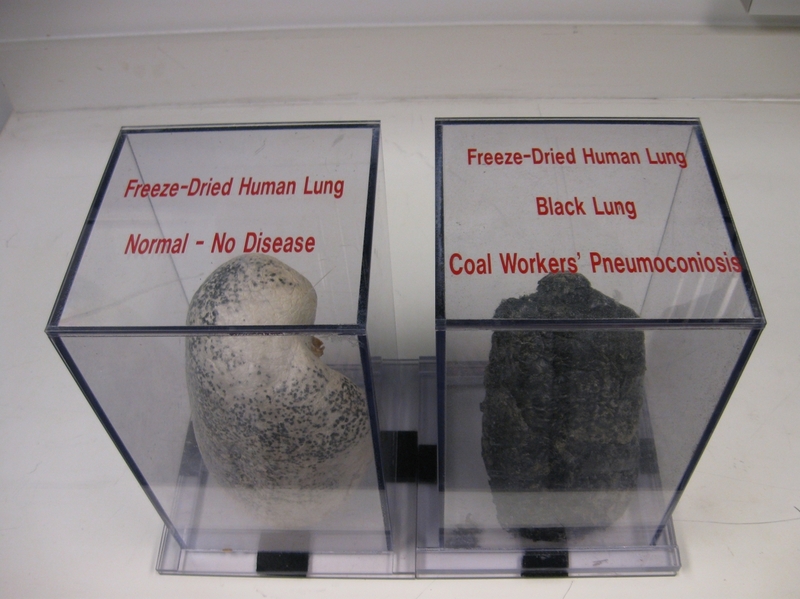 Excised and preserved lungs on display at the National Institute for Occupational Safety and Health in Morgantown, W.Va., in 2012, show the dramatic effect of black lung disease. Training, testing and certification are provided by the National Institute for Occupational Safety and Health, a federal research agency. The agency certifies "B readers" who are uniquely qualified to diagnose black lung based on X-rays. "NIOSH was not consulted about this bill," said spokeswoman Christina Spring, who also provided the comparative pass/fail rates of certified physicians who are required to take recertification exams. "There is no evidence that performing ILO classification, a standardized process for describing findings present on chest radiographic images used in evaluating black lung cases, is done differently by B Readers with medical backgrounds in radiology vs. pulmonology," Spring said. "To have that established process superseded by legislators and a political process is inappropriate," said Dr. William Thorwarth, CEO of the American College of Radiology. "This is a matter of life and death for many people," Thorwarth added. "Politics should be left out of it." Thorwarth also called on the Kentucky Legislature to repeal the changes, which came in larger "reforms" of the state's workers' compensation law. The revised law is "off base," said Bill Bruce, the executive director of the American College of Occupational and Environmental Medicine, a group representing 5,000 physicians who specialize in occupational and environmental injury, illness and disability. "There is no rationale for limiting X-ray interpretation to pulmonary physicians," Bruce told NPR Monday. "Qualified physicians in other specialties should be allowed to do so if they have demonstrated competency." The state Department of Workers' Claims reports that more than $3.3 million in black lung benefits went to coal miners in 2014. "Open to a better way of doing it"
The lead sponsor of the legislation was Rep. Adam Koenig, a Republican and real estate agent from Erlanger, Ky., who told NPR he "relied on the expertise of those who understand the issue — the industry, coal companies and attorneys" during the 14 months he spent working on the changes. In response to criticism of the law, Koenig said "not everyone who had a specific interest was involved. ... I'm not sure I was even aware of NIOSH." Koenig added that he is "open to a better way of doing it" and may seek a hearing on possible changes in the law during legislative interim committee meetings this summer and fall. "If the radiologists feel slighted, we're going to talk about it," he said. "And if they're right, we'll fix it." Kentucky's Legislature has completed its 2018 regular session except for addressing any vetoes by Republican Gov. Matt Bevin, who signed the workers' comp law that contains the new black lung provisions. "For all practical purposes, this eliminates the state workers' compensation black lung program," said Timothy Wilson, a Lexington attorney who represents coal miners. Wilson is also president of the Kentucky Workers' Association and participated in confidential negotiations focused on the black lung claims legislation. "The coal industry was directly involved," Wilson said, but he would not name the participants in the talks given an agreement that the discussions remain confidential. Even one of the nation's leading groups on pulmonology and respiratory disease has criticized the Kentucky law and urged repeal. "This law seems to have been specifically passed to exclude physicians who are neutral" in assessing black lung disease, said Dr. Robert Cohen, a pulmonologist at the University of Illinois, Chicago who has spent 30 years focused on black lung disease. The Kentucky law "is a disservice to miners," Cohen said. "It was ill-considered." Benny Becker is a reporter with Ohio Valley ReSource, a regional journalism collaborative reporting on economic and social change in Kentucky, Ohio and West Virginia.